The association of the different components of this product makes of it an excellent metabolic muscular catalyser. Group B vitamins and minerals which have an important function as coenzymes in energy and protein metabolisms of the organism, with a special function on muscle, bone and nervous systems which are restored to their normal function. Chromium´s main function is the generation of the Tolerance Factor to Glucose (GTF) which is a chromium dependent metal enzyme in charge of changing the oxalacetate into phosphoenol piruvate (precursor of glucose 6 phosphate). 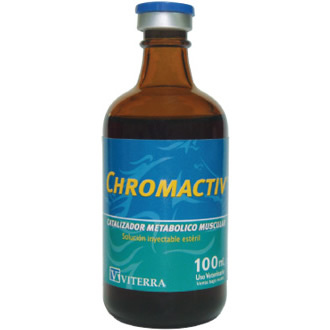 It is known that the main precursor of oxalacetate is lactate; therefore an increase in the contribution of chromium produces a correct and quicker metabolization of free lactic acid produced during anaerobic exercise, delaying the appearance of muscular fatigue. On the other hand it hastens recovery after exercise. Chromactiv is a muscular metabolic catalyzer indicated for high performance sport horses. Because of its exclusive formula it is indicated for over training, muscular dysfunction and poor performance syndrome, stiffness, torn muscles, stress and metabolic profiles with altered chemistry of the serum, as well as to improve the sport performance if used before competitions. Animals treated must not be used for human consumption. Keep the product in a clean, dry place between 5º and 35ºC and out of children's reach. Control heart and respiratory rate and mucous membrane during its administration.